With an estimated population of 870,887, San Francisco is the fourth largest city in California (trailing only Los Angeles, San Diego, and San Jose). In addition to being one of the most popular international tourist destinations in the world, the city is also home to a diverse population. However, there’s something you need to know: just the same as California as a whole, the average cost of living in San Francisco is high. If you’re interested in moving to the City by the Bay, it’s important to take a close look at the cost of living, as this will have a major impact on the decisions you make from both a personal and financial perspective. Now, it’s time to examine some of the many costs associated with living in San Francisco. According to Time, San Francisco is the most expensive city in the country to be a renter. 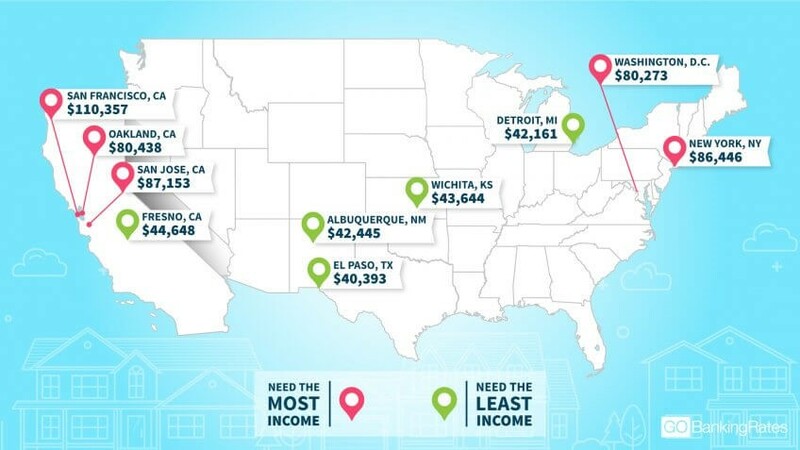 With the median cost of a one bedroom rental checking in at $3,590, San Francisco is at the top of the list (with New York City coming in second at $3,340). Just the same as renting, buying a home in the city is extremely expensive. According to a report by the Paragon Real Estate Group, the median home sale price reached $1.5 million in May 2017. These tips can go a long way in helping you realize your dream of living in San Francisco, all without breaking the bank. If you plan on owning a vehicle while living in San Francisco, you need to become familiar with the cost of fuel. According to the U.S. Department of Energy, the average cost of regular gasoline as of mid-February 2018 is $3.348/gallon. This isn’t the highest in the country (or state for that matter), but it’s definitely above average. Fortunately, San Francisco has one of the best public transportation systems in the country. This makes it easy to get around the area, even if you don’t own a vehicle. Note: you can learn more about all your public transportation options by visiting the San Francisco Municipal Transportation Agency (SFMTA) online. There are many ways to pay for your bus, rail, and cable car tickets, making it convenient to travel the city in this manner. For example, you can pay for each ride you take or purchase a monthly pass. Better yet, some people qualify for free access to public transportation, such as low income senior citizens. Housing and transportation are only two of the many expenses you’re sure to take on when living in San Francisco. You also need to consider the cost of utilities, as these are typically higher than the national average. For instance, the U.S. Bureau of Labor Statistics notes that the average household paid 20.5 cents per kWh for electricity in January 2018. This doesn’t seem like a lot on paper, but it’s nearly 52 percent more than the national average. How Much Should You Make to Live Comfortably in San Francisco? According to GoBankingRates.com, you’ll want to make at least $110,357 to live in San Francisco because of the cost of living. They used the 50-30-20 budgeting rule to come up with this figure where 50 percent of income covers necessities (like the examples above), 30 percent covers discretionary items, and 20 percent is for savings. If you considering this move for a job change, this may be a factor to include in your decision process. Despite the high cost of living, there are many benefits of moving to San Francisco. From the tech scene to the food, it’s truly one of the most unique cities in the country. Depending on where you currently live, you may need some help making the transition. And if you’re coming from far away, the cost of moving can be expensive. A personal loan can help with moving expenses, as well as costs associated with furnishing or remodeling your home and settling in.